So why is it cheap? Is it normally this cheap? Is it as attractive as it first looked? Conrad seems like a really interesting stock, something I'd usually be interested in, so I thought I'd take a stab at answering my own questions with the hope that I'd be looking at a good investment. Conrad Industries is in the business of building and repairing ocean going vessels as well as fabricating oil rigs and the related oil rig support vessels. The company's website seems to promote their role in the oil and gas industry but reading through the press releases I kept seeing orders for barges more than anything else. In 2011 of the 47 boats delivered 42 were barges, I think it's probably safe to say that Conrad is a barge manufacturer. The demand for barges is closely tied to commodity prices across a few different industries, energy, agriculture and construction. The barges I see mostly near me are carrying coal and gravel. During 2011 we delivered 47 vessel construction jobs comprised of 2 crane barges, 2 ferries, 9 LPG barges, 2 tow boats, 9 deck barges, a spud barge, 9 30,000 bbl. tank barges, 2 10,000 tank barges, 5 hopper barges, 3 striker barges, a push boat and 2 docking barges. The numbers are eye popping, I had to double check my math, how could a company like this be selling so cheaply? I always want to know why a company is cheap before I buy it. I know some investors think this is unnecessary but I want to make sure I'm not buying into a "cheap" company at the top of it's cycle right before sales drop off. Or buying into something cheap that has a lawsuit hanging over it that could wipe it out. Sometimes a company is cheap because there's a CEO who has said he'd rather spend the cash on acquisitions than give it back to shareholders (see Rimage..). There are a lot of reasons, but for my own piece of mind I like to know before investing. John at Portfolio14 says in his post that the stock was punished with the BP spill last summer undeservedly so, this seems more plausible. Of course the overhang from the spill is over so while this was probably a past reason for cheapness I don't think it's currently one. Note that John picked up Conrad during the which was a much better investment than mine in Seahawk Drilling. I think looking at revenue, margins, income and cash flow actually tells quite a story here. Conrad Industries is anything but predictable. A double digit jump in any value isn't unheard of, it's actually common. Likewise a double digit drop is just as likely. Revenue for 2011 came in at $246m, the highest ever and an increase of 28.8% over the previous highest amount from 2008. Revenue and income are highly dependent on when construction of certain ships are completed and that varies by the type of ships ordered. So in two different years ten ships could be ordered but in the first year eight of the ships completed and in the second year maybe only six completed leading to very lumpy results. Clearly investors were very excited about Conrad's results back in 2008 when they hit an all time high similar to today. The good news is the market price of Conrad seems to trade the company's performance. To me this says if the future looks better than now then Conrad has room to grow. If for some reason revenue drops, or net income drops look out below. This is really the most important question, and honestly the one I couldn't answer. The company seems to be in a great position financially, they have a strong balance sheet and are internally financed. The big question is how does the future look, will results in the future look similar to the past? I think there are really two variables to answering this question in my mind at least, the first is the age, condition and demand for river barges, and secondly the future backlog. At year end 2011 Conrad Industries had $144m in booked backlog if this is the only work they complete in 2012 revenue will take a significant hit in comparison to 2011. Although this would be a big hit it won't be all that surprising taking a longer term view. If the company is able to complete their backlog plus additional watercraft revenue will obviously be higher. The question is can they sell and build their backlog twice? I'd love to hear reader's opinions on Conrad Industries, bulls, bears please comment! For me the jury is still out as to whether this is the sort of stock I want to add to my portfolio. Just to comment about the unlisted, small cap/under $5 idea. Another reason why it doesn't make sense is that the person you are trading with, probably, does know all about the company. Indeed, I would imagine that the average trade in small stocks is more likely to be between informed investors as small stocks are too small for HFT. So small stocks should, perhaps, be more efficient, not less. I've experience this myself. I'll write about a small cap or unlisted stock and get a few emails from shareholders. The shareholders know every possible nook and cranny of the business going back years. I see this on message boards as well. People who really specialize in unlisted stocks are comprehensive. You need to be sure of yourself before committing capital to an idea that might take weeks to months to liquidate. Just to play devil's advocate here... you both raise a likely valid point, HOWEVER, the stock is still trading hands. So, you have to believe in these small caps either every buyer is a relatively uninformed person and every seller is a relatively well-informed (soon-to-be-former) stockholder, or you have to believe that the relatively well-informed people are constantly buying and selling from one another, in which case, who is the fool? I just bought CNRD last week (see: http://alphavulture.com/2012/03/31/conrad-industries-cnrd-pk/) and the question why it's cheap is also one that has remained a bit troubling to me: since there is a seller for every buyer, and it pretty clear that the company has managed to produce some great results the past 5 years. A small note about the revenues: that's not really a number that you should be looking at too hard, since a large part of their costs are steel, and the price of steel has gone up the past years so this is increasing revenue while not increasing profitability (most contracts have provisions so that the company can pass through steel prices) or units produced. My case for the company is basically that you don't have to bet on growth for it to be cheap, based on average earnings the past 5 years it's still very cheap and based on average earnings the past 10 years is reasonable priced. So any upside is free. About the historical prices: I would say that the intrinsic value of the company was significantly less in 2008, based on both the balance sheet and average earnings for the past period since 2003/4 were bad years. In 2008 that price was a huge premium to book value. About the cyclicality: Golf of Mexico related work used to be a really big part of revenue's in the past, and activity in that sector is till muted, so certainly some room for upside. The company managed to diversify into other sectors pretty successfully. I think I understand your point about revenues, but not sure I agree. They had the same operating margin in 2010 and 2011 11%. In 2010 they did $10m and in 2011 they did $19m. So either they built more boats in 2011 or they have a significant amount of operating leverage which is what I suspect. I want to know the breakeven point of the leverage, that would be the interesting number. Have you looked at competitors at all? I can't figure out what makes Conrad so special that they are getting a ROE north of 30% ex-cash. Those sorts of numbers are common to companies with a monopoly not a commodity ship builder. Is the whole industry trading at low multiples like this? I briefly looked at Todd Shipyards (TOD) when I bought CNRD last year. TOD was in Seattle and was acquired around that time at a higher multiple. Frank Voisin has a post on this. I can't remember the exact details now. What I remember is TOD had comparable but lower op margin than CNRD. TOD did mainly maintenance and maintenance has higher margin than shipbuilding at CNRD. About the revenues: it's a complex equation and a lot of other factors are of course also contributing, and I don't know how much of your cost of goods sold is exactly steel, but I'm pretty sure it's significant. And because of that I don't think revenues are a good proxy for the volume of production, and it is also distorting margins. When you look at the gross margins you see that they are getting lower since 2008, and that's certainly consistent with a world where steel prices are rising and a manufacturer that is able to pass those costs on to buyers. Instead of a boat costing 1 million with 200K profit for the company that same boat now costs 1.2M with the same gross profit. And since it still takes exactly the same work to build this boat it's just as profitable as before, even though the gross profit margin is down. So what I think is that, if steel prices would have remained constant the company would have had a lower revenue in 2011 (but still a lot higher than 2010). Exactly the same gross profit, and because of the lower revenue's a higher gross profit margin. About the high ROE: maybe the company's book value is understated (have to look into this, maybe they have old stuff carried at cost or depreciated stuff that's still valuable). So maybe their return on real equity/replacement cost isn't that high. But just speculation here. But I certainly agree with you that you don't expect such a high return in a business like this unless supply and demand is totally out of balance. Our backlog was $47.1 million at December 31, 2011 as compared to $89.5 million at December 31, 2010. At December 31, 2011, 91.2% of our vessel construction backlog was from other commercial contracts, 7.5% was from government contracts and 1.3% was from energy contracts. This compares to backlog at December 31, 2010 of 58.9% other commercial and 41.1% government. Subsequent to year end, we signed contracts totaling $61.8 million which includes the sales of six of the stock barges in progress at December 31, 2011. Our estimated backlog at March 31, 2012 is $68.7 million. Glad I stumbled upon your blog. From Hielko's comments and what John wrote up on his blog it appears the Gulf of Mexico is a much smaller piece of the pie. However, it was mentioned about the potential upside from this industry when it recovers. For what it's worth I work for a shipping company that provides work boats for the oil and gas industry and the ramp up is currently under way. My employer recently initiated a large new build program and some of our competitors are as well. Many of the boats that were cold stacked int his industry are back to work now and drilling activity is in increasing so the opportunity for growth in the gulf is creeping back. Maybe some upside associated with this.....? 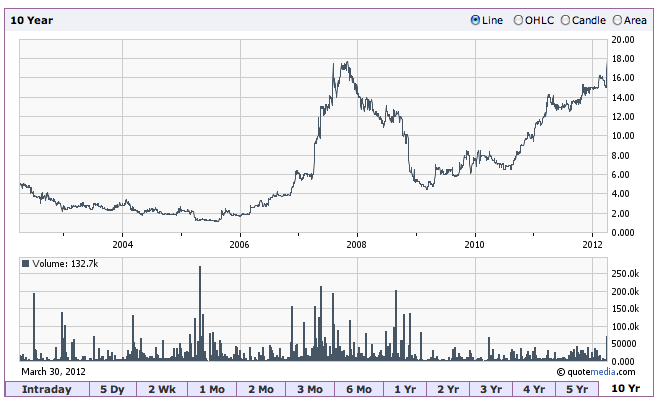 Here is a longer price chart (back to 1997) with EBIT margin plotted as well. You really got me think deeper about my assumptions and reasonings. I found CNRD's low SGA amazing. I'll wondering if it's because they are not unionised. Most of their employees are on short contracts. Notice also their job op page says they want Spanish/English speaking supervisors. Another interesting tidbit I found is, there is this shipyard can Jeffboat in Indiana. I believe it's a division of ACL. It's said it's the largest inland shipbuilder. Their shipyard takes up 68 acres. I think CNRD has about 40 acres, plus another 50 acres land just purchased. That puts the scale in perspective. Oh, one more thing. From the last 10-K TOD filed with SEC in 2010, my back of envelope calculation tells me: TOD has Sales/Equity 1.8-1.7. CNRD 2.0. Again, they are not directly comparable because TOD did maintenance while CNRD builds boats. But this still points me back to CNRD's SGA as a key factor of its profitability, as TOD had higher gross margin. In reply to John. SG&A is not going to capture the labor costs to construct barges. That would be in COGS. While I don't know if they are unionized or not, it would not surprise me if they were not. If you look at the last nine years what is amazing to me is the lack of increase in SG&A. It was $4.7 million in 2003 (14% of sales) and only increased to $4.8 million in 2010 and $5.4 million in 2011 (2.2% of sales). It is essentially a family-owned business and the family hasn't been paying themselves a lot more as business has picked up. They probably were "underutilizing" their existing management capacity so there isn't a huge need to hire more midlevel (SGA) type people to keep things running smoothly. Maybe this is a stock that trades on orders? Would be interested to see what the stock price looks like on a graph with orders. Economically-sensitive stocks generally trade at extremely high valuations when things are terrible and extremely low multiples when you are near the peak, so knowing where you are in the cycle is the most critical aspect of investing. Kirby Corp (KEX) is a big user of barges - maybe see what they are saying / what their capex plans look like? Just a thought. Good post and good discussion. I own Conrad from summer last year. P/B = 127/37 = 3.4x! 4) The compensation is quite low. I love that. 5) The company is conservatively run. 6) Buybacks have been good. 8) the Oil and gas industry used to contribute a lot towards the repair segment. This is down a lot from the peak and is flat last 3 years at $50m in sales. So there is some potential for this to improve in the coming years? 9) I worry about ship construction. That more than doubled last year. I am not sure that is sustainable. The business is clearly cyclical no doubt about that. Finally, the EBIT generated in last 5 years that included the big recession and Gulf oil spill was $150million. Current EV is 1/2 that. That certainly points to clear cheapness. Why do you have only $26 million for cash? It was 43.6 million at year end. Are you subtracting something from it? In short, there was an accrued payable related to a cancelled contract for $18m. The refund was paid in February reducing cash down to $27m. I didn't catch this either. Thanks for posting this, your comment has a LOT of good information in it. I really like the stats you have from the other barge builder buyout. Take a look at page 51 (Note 5) on the annual report, the full 18M account payable was not repaid. There was 2.3M owed based on contract terms. Further some of the vessels were sold to other customers prior to year end. Could it be that the new customers of some of these projects got generous payment terms (ie 90 days vs a deposit upfront) without CNRD having to cut into profits? I compared to 2010 and there was not a similar occurrence. I very well could be reading this incorrectly but I am thinking the cash position will not be impacted negatively. If I am wrong, there is such a huge margin of safety still in the stock. My pleasure Nate. this is an excellent blog. Keep it up. How about those Japanese net-net's?